I wanted to use my Sony FD91 digital camera on a telescope to take images of the Moon and planets. The telescope I am using is a 9" refractor at the Godlee Observatory, home of the Manchester Astronomical Society on the roof of U.M.I.S.T. in Manchester UK. 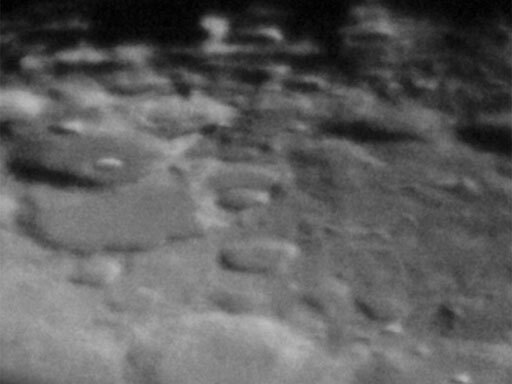 To start with I had no means of fitting the camera to the eyepiece of the telescope, so I did my best by trying to hand hold the camera just behind the eyepiece and I had to take a great many images just to get a few that are not only half decent, but also in the field of view. It is extremely difficult to keep the camera steady and on the optical axis as well as try to compose focus and take the image at the same time. Not to mention balancing precariously on a ladder as well! Then I discovered the LE-Adapter. This is a piece of kit that screws on to the filter thread of the Mavica, and fits over the eyepiece barrel, therefore making this complicated business far easier. LE-Adapter: showing the thread that fits to the camera lens. 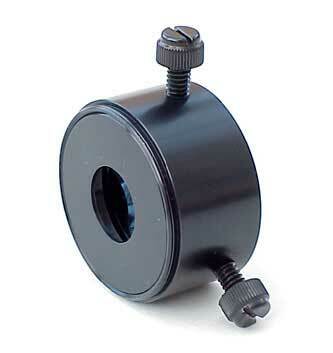 LE-Adapter: This end fits over the eyepiece. Before I got the LE-Adapter I was a bit concerned that it would not hold the weight of the camera, so I also asked for a support arm, which is sold separately. The is a bar that fits on the bottom of the camera in the tripod bush, and on the adapter via one of the screws. I now felt much happier about this, as I did not like the idea of hanging the whole weight of the FD91 (which is quite a heavy camera) just by the filter thread. These images show how it all looks when attached to the camera. Unfortunately for a number of reasons I have not been able to use the adapter as much as I was hoping to. 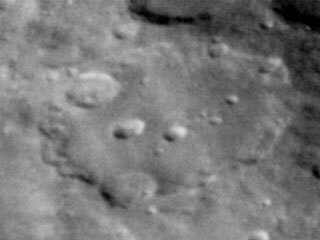 This is mainly due to the weather, the position and time the Moon is visible, but also due to renovations to the observatory. But I have used it on two occasions so far. Another problem with astronomy is that even when it's clear, the seeing conditions are very often not good, this has applied to both times I have used the LE-Adapter, so the example results shown below can be improved on a great deal. All were taken with the camera set to auto everything, even focus, which worked better than me trying to focus manually. When I received the LE-Adapter, I was very impressed by the quality machining of the parts, it is made to a very high standard. 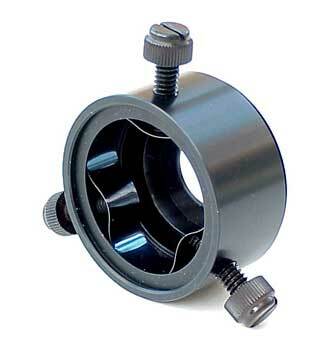 It is a very clever design allowing it to be fitted to many different diameter eyepieces without any extra fittings. Fitting the adapter to the camera is quite easy, fitting it to the eyepiece was reasonably quick, I got better, the more I practiced. 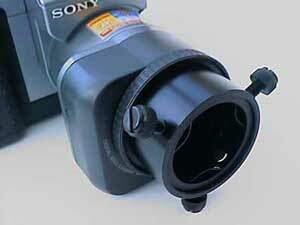 The trick is to get the eyepiece in the centre of the adapter by tightening the three screws evenly. Once the screws are tightened you are ready to shoot. As the camera is very heavy, you do need to make sure that not only are the adapter screws tight, but to make sure that the eyepiece is not going to slide out of it's drawtube! I did on a number of occasions feel the adapter tilt very slightly, so just to be on the safe side, I kept the camera strap over my neck, it would make a very expensive sounding noise if it hit the floor! This was only really needed because the eyepiece was not securly fitted in the drawtube in my case, I think the LE-Adapter would have held it. In any case it never did slip off, phew! 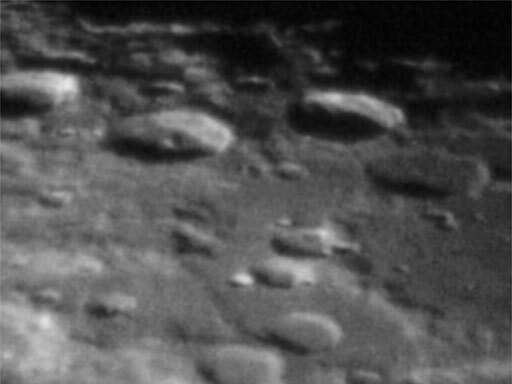 A small selection of lunar images taken using the LE-Adapter. Overall I think the idea of the LE-Adapter is very good. It does not work with all eyepieces, it depends on the outside diameter of the eyepiece, and how much of it protrudes from the drawtube. The LE-Adapter will accept eyepiece diameters up to 40mm (This is the opening measured with a rule, so may not be too accurate). The LE-Adapter can also be used on the Sony Mavica FD71, and I have no doubt that there would be no weight problems with this camera. It is not restricted to the Sony Mavica cameras of course, any camera that has a 39mm or 52mm thread will fit straight on, and with some step-up/down rings purchased from a camera shop, it could be made to fit a great many cameras amd video cameras. 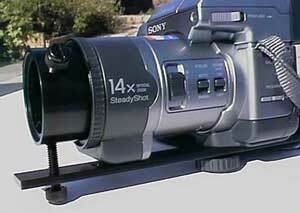 If a video camera is used the Support Bar will be required, which is what it is really meant for. The Stillwater Trading Company have a an unconditional guarentee against defects for the life of the product. They also have a 30 day no-hassle return policy... if you are not completely satisfied with the LE-Adapter just return it and they will promptly forward a refund. You can't say fairer than that. Take a look at their web site http://www.lensadapter.com/ for more information, prices and ordering details.